Developmental and clinical psychologist Diane Ehrensaft, PhD, has devoted her career to the care of children and teens who do not abide by the gender binary, either in their gender identities or expressions. 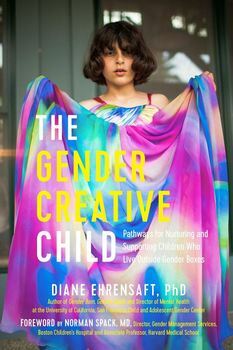 In her first book, Gender Born, Gender Made, she coined the phrase “gender creative” to replace what the Diagnostic and Statistical Manual, at the time, still officially termed a “disorder.” Now, in The Gender Creative Child, Dr. Ehrensaft gives families, teachers, and therapists a totally up-to-date, comprehensive resource to caring for children whose gender expression is fluid or who question the gender they were assigned at birth. In nine easily digestible chapters, she encourages both parents and professionals to listen to the children, support their quest for their authentic gender selves, undertake a highly nuanced assessment of their particular needs, and advocate for a gender-expansive world. A thought leader and champion of gender-creative identity, Dr. Ehrensaft illuminates the many routes that children may take and answers the many questions that parents and others will have.